“PEARL HARBOR FINAL JUDGEMENT” By Henry C. Clausen and Bruce Lee. 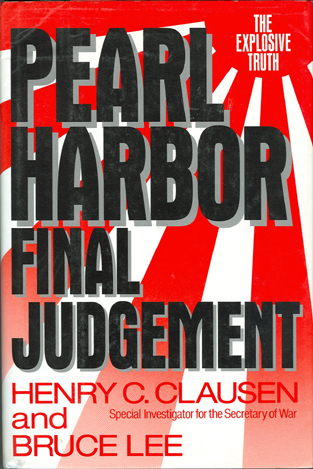 In 1944, Secretary of War Henry L. Stimson selected Henry C. Clausen to investigate the December 7, 1941 Japanese attack on Pearl Harbor, Hawaii. Over seven months during 1944 and 1945, Clausen traveled more than 55,000 miles to interview and obtain sworn affidavits from nearly 100 Army, Navy, civilian, and British personnel. Clausen presented an 800-page report to Secretary of War Stimson––but because his report was classified Top Secret, he did not write a conclusion. That conclusion would have torn apart the government to the United States and revealed the breathtaking secret capabilities of the Allies to crack Japanese and German codes. Clausen’s “Final Judgement” puts an end to all the conspiracy theories mistakenly based on perjured testimony and self-serving misinformation that continued to pollute the historical record. 1992 First edition Hardback with dust jacket. 485 pages, 34 historic black and white photos, 1 map a large appendix and an index.